Hadar’s Test Run........ The Aftermath. It's time for us to set off. 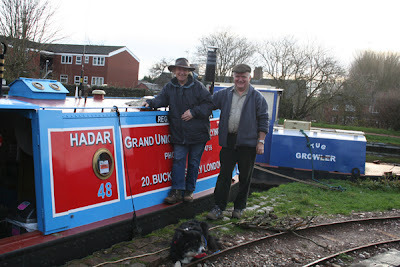 The time has finally come for us to leave Roger Fuller's Boat Yard and head off on our adventures with Hadar. We took on 3ton of coal from Harrisons Coal Merchants, as you can see it was a joint effort loading the coal from the lorry into Rogers railway wagons. Roger then drove the first lot of coal around to Hadar, and he and keith off loaded it by the hold, before coming back for more. 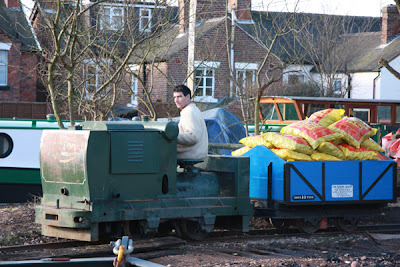 Keith then took the last load round with Steve (welder) and I on the wagons for good measure. 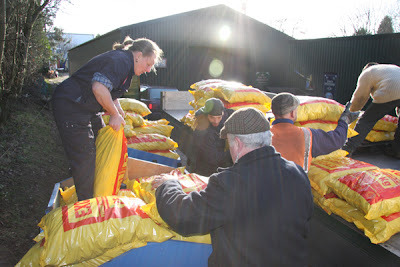 We then had the hard task of loading all 120 bags into the hold, making sure to keep the load as even as possible and as far back to make sure the bow did not dip to far into the water. It was a success thanks to the help of Roger and Steve, thanks guys. So Keith and I are off this coming Thursday to begin the dream that keith has had for almost 40 years. That dream has been made possible by Roger and those that work at the yard, the two Steve's and Tina the boat painter. On Friday we opened a bottle of champagne to toast the finishing of our boat and to wish everyone at the yard well for the coming year. We will always think of Roger and the gang with fondness as they have been wonderful throughout the whole build of our boat. We wll be coming back to see everyone, so they cannot get rid of us that easily hahaha. 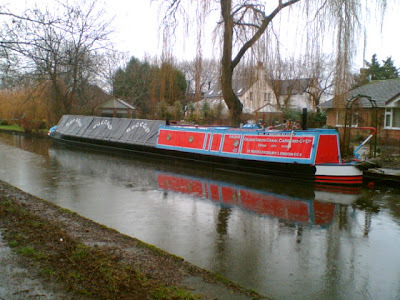 With Yard Lock closed until the 11th February our plan is to go up on to the Macc for a short while until we can get down South on to the Oxford, so if you see us out and about please say hello or give us a wave, better still if we are moored up come and share a brew with us. We will be keeping hadar's diary going, but a lot will depend on connection, so please continue to pop in from time to time to see how we are getting on. See you on the cut somewhere. As yesterday we were busy showing some prospective customers for Roger around Hadar, today was the 1st opportunity Keith had to set about retorqueing the head as planned and to correct any problems we had experienced whilst away. Once he had retorqued the head he fitted a new thermostat to the engine, as the one that had been fitted by the engine restorers was too low a temperature setting at 60C! Keith ran the engine to warm it up to do an oil change, the new thermostat works well, and now the temperature gauge that he fitted also works properly. Keith then drained the oil out and put some new in. During our test run we had noticed that the domestic alternator was not charging the domestic batteries. Keith checked various things and eventually traced the cabling and discovered that they had accidentally wired this alternator to the start battery, no wonder the domestic batteries were not charging, mind you the starter battery was well charged! A quick change of the wire connection and everything is now charging correctly. Upon Rogers return with the tug which had been used for some canal maintenance Roger made the wood plate we need to cover the coal skuttle to stop Marmite from using it as a litter tray! Keith managed to loosen up the slide hatch, and this now just needs a small block to stop it riding too far forward when closing it. All that now remains is to find the leak we have in the generator cooling pipework tomorrow and everything is not only completed but functioning correctly. 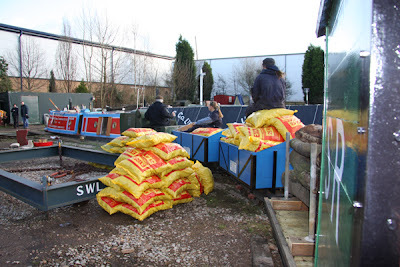 All we need now is the extra 3 tons of coal we have ordered to arrive tomorrow or Friday, and then we will be ready to set off on our adventures as soon as Yard Lock is repaired and we can head South on our big adventure. We will be sad to say goodbye to those people who have become good friends at the boatyard, but we will be back in October for the Stone Food and Drinks Festival, so they cannot get rid of that easily hahaha. 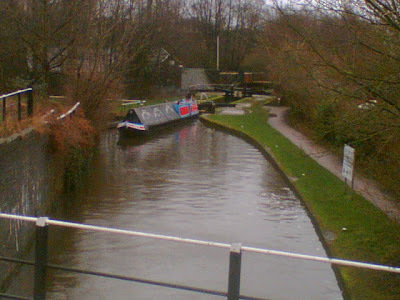 We hope that you will continue to follow our adventures around the canal system. Well today we managed to get the last few jobs completed on Hadar and we set off at 3:00pm heading north. Hadar reversed perfectly. 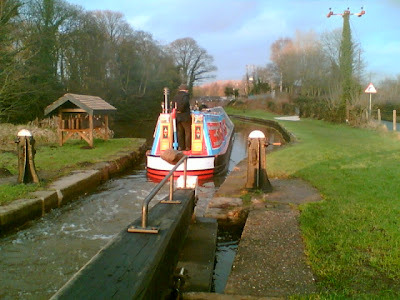 Once we cleared the last lock, we headed for the Wedgewood Factory at Barlaston for an overnight mooring. This section was a great chance to see how she handled through bends, and along the straight bits. She behaved just like we hoped, she followed the channel, and basically steered her own course, which is just how it should be. She needed very little steerage to go round bends. Full marks to Roger, he has built a great boat. She handles just like a small Northwich should. We made it to the moorings at the Wedgewood factory, just as the light and weather was failing, and moored up for our first real night away from the Boatyard. Hadar’s Test Run, Day 2. We started the day with a cooked breakfast, sort of a treat for finally getting away. Keith loves cooking a cooked breakfast, Poached eggs on toast, with grilled bacon, grilled mushrooms and grilled tomato. We would have had sausages, but I forgot to take them out of the freezer last night, oops. We set off on what was to be a short run through Trentham Lock. 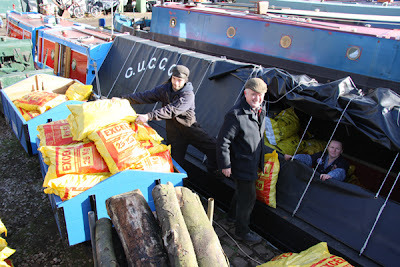 Above the lock we sold 4 bags of coal to a narrowboat 'Antler' who was coming down, unexpected but welcome all the same. 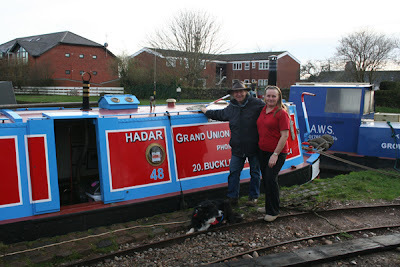 Then onto Trentham, where our friends have a canalside property with a mooring long enough for Hadar to fit. We chatted for quite a while over coffee before having a late lunch. We stayed on their mooring for the night. Hadar’s Test Run, Day 3. The weather had not improved much, it was still raining, but at least it was not hammering it down, as it had over night. Well we had intended on leaving our friends mooring and winding at the winding point not far from their property. It needs dredging, so we carried on to the next one. Well one look and no way were going to wind there, so we pressed on up through the Stoke Flight and stopped at Westport lake for lunch. After lunch we continued on up to Harecastle Tunnel where we winded, and moored up for the night. It had been getting quite blowy so we were glad to be moored up in the shelter of the cutting on the south side of the tunnel. Hadar’s Test Run, Day 4. Well an earlyish start from Harecastle Tunnel, and we arrived at the Wedgewood Factory for lunch. We surveyed the weather and decided to carry on back to Stone, whilst it was not too bad, not knowing what the weather would be like tomorrow. 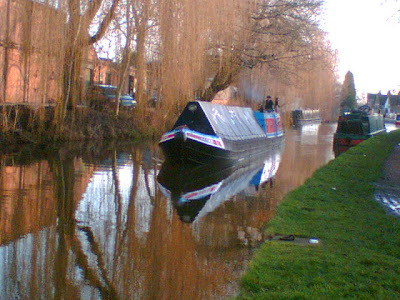 We are moored up on the towpath awaiting to go back into the Basin for Monday. Good thing we did continue on, looking at the weather forecast at 6:00pm on th TV for tomorrow. Both Keith and I enjoyed our few days out on Hadar, we cannot wait now to get moving on our continuous cruising and the adventures it will bring. In this age of networking and blogging, we all get to keep in touch with what other boaters are up to and where they are cruising to and from. What is exciting is when you get the chance to actually meet up in person with a fellow boating blogger. Today was such a day for Keith and I.
I received an e-mail from Sue on NB No Problem. 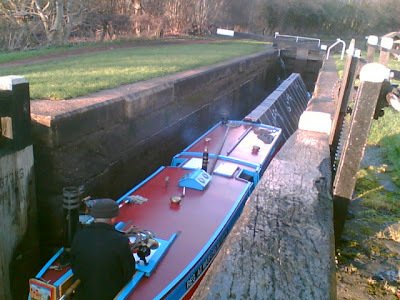 Both Vic and Sue were moored up below Star Lock in Stone, so we agreed to meet up. Sue very kindly came and found us at the boatyard, as I am not walking to far at the moment after putting my back out on Thursday. Meeting up with Sue and the collie's Lucy and Meg was like meeting a dear long time friend, she is a truly lovely lady (no blushing now Sue). I could sit and natter to her for ages without any problem at all. I felt it was as if we had known each other for many years. We sat and had a natter over a cup of coffee as you do when you meet up with other boaters, before Sue headed off back to No Problem. We sincerely hope that we will meet up with them again very soon, so we can sit down and have another good old chinwag. Happy cruising Sue and Vic, see you very soon I hope. The New Water Pumped Installed. Happy New Year everyone. Christmas and New Year for us was very quiet, just how we like it. 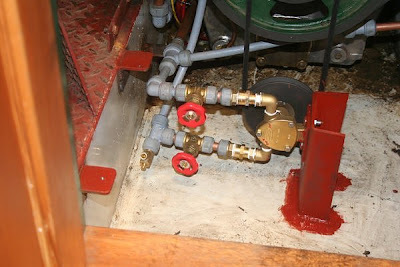 Yesterday Roger fitted the new water pump for the engine. Today Keith ran the engine and everything was working well. In fact he ran the engine for 4 hours. We are looking forward to taking Hadar out for a test run next week. Let's keep our fingers crossed. So we have said goodbye to 2007 and hello to 2008. Lets hope it is a good year for us all. We all have places to see and people to meet along the way. We are looking forward to getting underway, so we may enjoy cruising the waterways with our new boat. We hope that 2008 will bring good health, peace and happiness to everyone we have already met and to those people we have yet to make our friends. May Roger Fuller, Tina (boat painter)and the two Steve's (welders) have a prosperous 2008 at the boatyard. See you on the waterways.